Knowledge defines success, and there’s no limit to the knowledge you can consume to be successful. To get ahead, you need a comprehensive understanding of the industry, opportunities to develop a broad range of skills and access to the latest technologies and leading innovations in experiential graphic design — and there is no better place for enhancing your knowledge of all things XGD than SEGD. With a network of experiential graphic designers from around the world, representing leading design firms, SEGD members have a wealth of information at their fingertips. 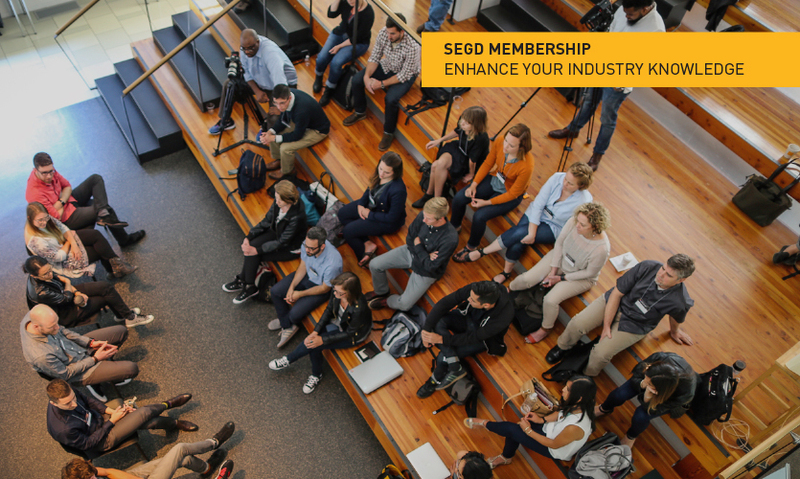 Throughout SEGD.org,as well as at our events,you can access information on everything from the best projects to best practices to new products to the latest innovations in the industry. SEGD Global Design Awards: Every year, hundreds of entries are submitted for the SEGD Global Design Awards competition.A dedicated jury of your peers then selects the projects that best exemplify innovation in design. Those projects are then profiled and featured on SEGD.org, as well as in the SEGD printed annual— which is sent to all members as a member benefit. Events: SEGD events provide invaluable opportunities to learn from your peers, as well as experts in the field. Targeted events—like Wayfinding,Branded Environmentsand Exhibition and Experience Design— focus on specific topics within XGD, while broad events — like the SEGD Conferenceand Xlab— allow you to understand the state of design, as a whole, and where it’s going. SEGD Talks/Courses: Even if you don’t have the opportunity (or budget) to leave the office, you still have access to SEGD Talksand SEGD Courses.Free to all members, SEGD Talks cover key sessions from SEGD live events. SEGD Courses allow you to learn from the comfort of your desk and feature content for all levels, from emerging designers to experienced professionals. SEGD Courses are available to members at a discounted cost. Benchmarking Reports: Know how you and your firm compare to others with SEGD Benchmarking Reports, available to members only in the SEGD Toolbox. The SEGD Toolbox features data on skills, management software, hourly billing rates and more! Webinars: Learn about the state of XGD, get an intro on how to design with code or brush up on SketchUp on your lunchbreak. Free to all members, SEGD’s live webinarsprovide insights into hot topics from the comfort of your office. Communication + Place: Published online, Communication + Placefeatures articles from both academics and professionals advancing the XGD profession through creative research, curriculum development, project reviews, and user-centric testing. Learn about new approaches and innovative practices on the horizon. Are you ready to enhance your industry knowledge? Join or renewyour SEGD membership in August, and you could win a free year of membership or a free Firm Listing!